Kenneka Jenkins was last seen on the Crowne Plaza's ninth floor, witnesses told police. Authorities in suburban Chicago are investigating a young woman's mysterious death over the weekend, a case that's gained national attention as her mother angrily suggested there was foul play and accused police and others of failing to act fast enough upon learning of the disappearance. 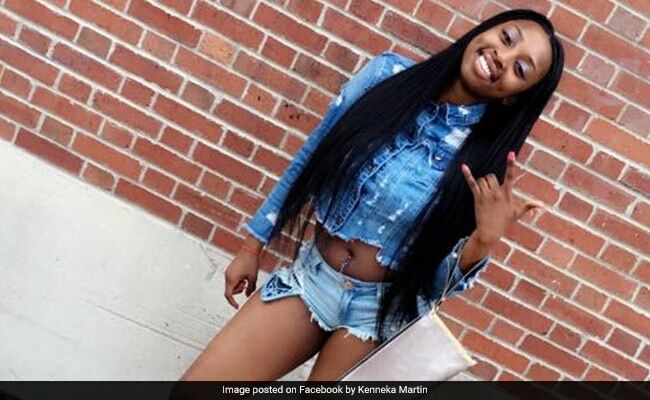 Kenneka L. Jenkins, 19, was found dead inside an industrial walk-in freezer at Rosemont's Crowne Plaza around midnight Sunday, more than 24 hours after leaving her home on Chicago's West Side to party with friends at the hotel and conference center near O'Hare International Airport. "To me, I feel like they helped kill my child: the police department and this hotel," Teresa Martin, Jenkins' mother, told local media during a raw, emotional interview alongside other family members. She said neither the authorities nor the hotel's staff did enough to address her repeated pleas for help. Jenkins' mother said authorities told her the freezer, though in a vacant part of the hotel complex, was functioning and cold, the Tribune reported. It's unclear who found Jenkins' body, however, or whether there were signs of trauma. The clip has fueled speculation online that the young woman's death was no accident, with skeptics endeavoring to decode the video and surface clues that point to a potential setup. Jenkins was last seen on the Crowne Plaza's ninth floor, witnesses told police. When friends were unable to find her before leaving the party, they phoned Jenkins' mother. Jenkins' friends, Martin said, told her the young woman disappeared after they briefly left her alone in the hotel hallway to retrieve her car keys and cellphone from the room. But Martin has since questioned that account, telling local media gathered outside her home Sunday that the friends' description of events keeps changing. Martin has lashed out at authorities and hotel staff, who she accused of waiting too long to review surveillance footage. The hotel staff allegedly told her they required a missing person report before doing so, the Tribune reported. They also called police after Martin and members of Jenkins' family began knocking on doors Saturday to look for her daughter, Martin said. The Crowne Plaza's general manager did not immediately return a message from The Post. Martin also complained that police refused to let her view Jenkins' body. "Why can't I see my daughter?" Martin told reporters moments before she burst into tears. "Why can't I see how she died?" Martin said police initially told her Jenkins was intoxicated when she entered the freezer, that "freak accidents like that do occur." But now she questions whether her daughter, if indeed inebriated, could have summoned the strength and coordination to open the freezer's heavy door. Balogh, the police spokesman, told The Post that officers were following procedures while securing the crime scene and interacting with Jenkins' family at the hotel. "Anything further regarding what happened, in terms of her mother, we're not really saying much about that," he said. Falsely accused of satanic horrors, a couple spent 21 years in prison. Now they're owed millions.